Our research team recently received a question from Ms. Vivianne Perret regarding Joseph Velle. Vivianne wanted to know the details of his life but was unable to find much information. To answer her question, I spent the month of April conducting extensive research at the National Archive and National Library of Hungary, where I uncovered some interesting original documents. 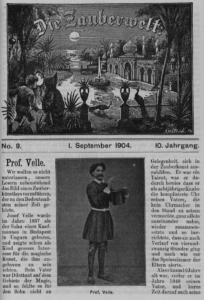 In addition, a 1904 article in the newspaper „Zauberwelt” provides additional details. In this post I present my comprehensive findings regarding the life of Joseph Velle, starting with the following synopsis of the 1904 article. 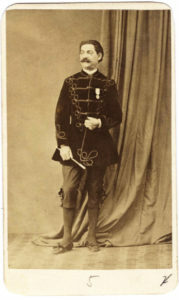 Joseph Velle was born in 1837, in Pest – capital of Hungary. The son of a merchant-trader and amateur magician, Velle displayed talent as a magician at an early age. Tragically, his father died during the Hungarian Revolution of 1848, and his mother died soon after. In order to support his younger brothers and sisters, Velle, who was only 12 at the time, became a traveling magician, earning fame from his performances in and around Pest. His act gradually took him further and further out into the countryside, where people would often pay him with bacon, rice, flour, and potatoes, which he then sold, using the proceeds to support his siblings. Velle met and got to know the famous magician Bosco in the following years. Bosco advised the young magician, after seeing some of his tricks, to take a stage name and start traveling even more widely. Thus, 17-year-old Joseph Velle became Professor Velle. Velle served in the military for a short time, at one point being asked by an army major to perform his magic act. Velle agreed but asked to borrow 12 talers (silver coins), which he then made disappear. The army major was so astonished by this trick that he gave Velle the 12 talers. Velle’s fame quickly spread. Upon leaving the army, he traveled throughout Europe, enjoying great success in his performances in Germany, Russia, England, Italy, France, and Spain. He performed at royal courts and for nobility and was awarded a variety of merits and orders. In 1867, he met magician Compars Hermann in Milan. At first, the rival magicians detested each other. All of the tricks that Hermann would present one evening would be duplicated and performed by Velle the next day! 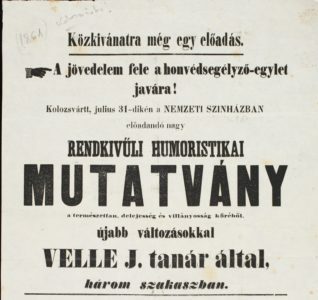 Velle advertised himself in the newspapers and made a parody of Hermann’s tricks. This act of professional sabotage enraged Hermann, but the two soon found that they could be more successful—and make more money—if they performed as a single act. They soon joined forces, splitting costs and profits equally, and earning a reported 15 thousand lires each every night. Viewers were divided: some cheered for Hermann and others for Velle. While there was no question that Hermann was technically the better magician, Velle’s confident stage presence and wildly humorous act made for a very successful pairing, with differences in skill that only the most astute magicians could detect. Velle was known for wearing a black velvet jacket while performing—instead of the traditional formal tails—in order to show the audience that he was hiding nothing in his coat. He used only a few props, gadgets, and tools in his act—performing card tricks, pulling flowers from hats, etc.—but his minimal use of these items only underscored his skill as a sleight-of-hand artist. Velle, who spoke 11 languages, died at the age of 52 in 1889, in Perugia, Italy, and he was buried there. This is his life story, so now let us add some details by viewing some original documents about Joseph Velle! The first is a letter I found in the Hungarian National Archive—a letter by Joseph Velle himself. This four-page letter has never been published before, but you can see it in the attached photograph. 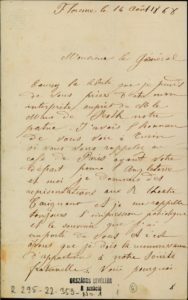 The letter is dated August 14, 1868, and was written in Florence, Italy. Velle is addressing an important person, General George Klapka (Klapka György). George Klapka was one of the leading figures of the 1848 Hungarian Revolution. He lived in exile after the Revolution, returning to Hungary in 1868. An interesting side note: Jerome K. Jerome, the famous English writer and humorist, received his middle name from Klapka (Jerome Klapka Jerome). In the letter Velle asks General Klapka to help him contact the Mayor of Pest, to whom he had written twice and received no response. 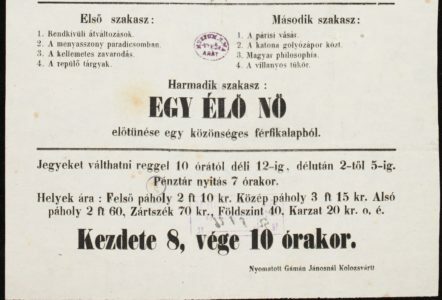 Velle urgently needed his birth record, which he claimed to have left in Pest seven years earlier when he left Hungary. He believes that General Klapka could help to expedite his request and asks that the birth record be sent to him in Turin, Italy. 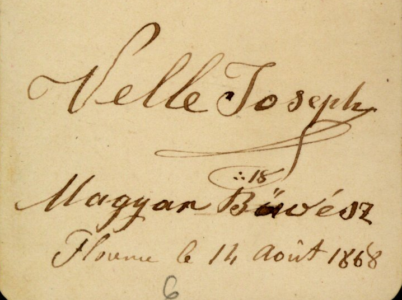 On the backside of the photo he identifies himself as a „Hungarian Magician” – „Magyar Bűvész” and he signs the letter as Velle Joseph, just putting last name first – because this is the official way of writing names in Hungary. In the letter he mentions that his performances are very popular and that he attracts large audiences. He declares that His Royal Highness, the King of Portugal, awarded him the Dona Maria Award, and that he also received an award in Italy. He emphasizes that he is still Hungarian in his heart and sends regards to all of his fellow Hungarians. Let us see what other documents we can find regarding Velle’s performances in Hungary. One can conclude that Joseph Velle was very committed to his art. While perhaps not the most celebrated magician of his time, he nevertheless achieved fame and fortune despite his childhood hardship. His son, Gaston Velle (1868–1953), was a French silent film director and pioneer of special effects, who was prominent in early French and Italian cinema during the first two decades of the 20th century. Like his father, Gaston began his career as a travelling magician, before putting his illusionist skills to work in cinema and ultimately creating more than fifty films between 1903 and 1911. He worked under Auguste and Louis Lumière, before serving as the head of production for the Italian film studio Cines. But he is best remembered for his work at Pathé, where he was hired to produce trick films that might rival those of his contemporary, Georges Méliès, including classic shorts like Burglars at Work (1904). Ms. Olga Granasztói, Mr. Botond Kelle, Mr. György Rácz, and Mr. Michael Sondermeyer. Such a brilliant post. Thank you for your research. Up to me now to unravel the links between Gaston Velle, his son, and Houdini, when they probably both met in Paris. Minden jog fenntartva. A honlapon található tartalom a szerzők szellemi tulajdona, így a mindenkori szerző a szerzői jog jogosultja. A honlap vagy annak bármely részének jogosulatlan felhasználása a szerzői jog megsértésének minősül. A honlap eredeti tartalma, illetve oldalainak bármely alkotóeleme (szöveg, kép, hang, videó, animáció stb.) csak a szerzők előzetes, írásbeli engedélyével használható fel. - Copyright © 2016. All rights reserved. No part of this website may be reproduced, distributed, or transmitted in any form or by any means, including photocopying, recording, or other electronic or mechanical methods, without the prior written permission of the authors. For permission requests, write to us.